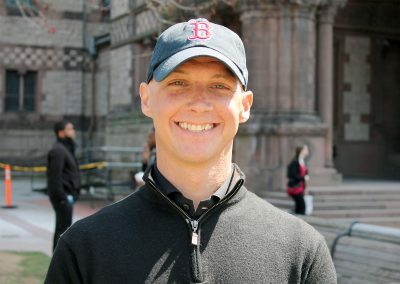 Exactly one year after Timmy Harner was diagnosed with acute myeloid leukemia, he received what many runners would consider the call of a lifetime: he was going to run the 2017 Boston Marathon. Harner, a 31-year-old who hails from Tower City, Pennsylvania, said that when he went for a run on Nov. 2, 2015, he immediately knew he was not keeping up with his usual pace. Two days later, Harner went to the doctor for blood work. On Nov. 6, Harner’s doctor told him he was fairly certain Harner had leukemia. Harner was admitted to the Penn State Health Milton S. Hershey Medical Center, had his first bone marrow biopsy and was diagnosed with AML, a type of cancer that affects the blood and bone marrow, on Nov. 10. He started chemotherapy treatments the next day, but after several rounds, his doctors said his leukemia was so aggressive the only thing that would save his life was a bone marrow transplant. While Harner was hospitalized, one of his biggest fears was not being able to run again. Harner recalls being so physically exhausted from chemotherapy treatments that his father had to help him through the front door. Harner said he now considers himself blessed. He was matched with an acceptable donor and received a bone marrow transplant on March 2, 2016. Harner has been cancer-free ever since and ran the Boston Marathon on Monday, finishing with a time of 04:06:38 as part of the Leukemia and Lymphoma Society’s Team in Training. Looking back, Harner said the disease actually saved his life. Harner said he applied to Team in Training after hearing about it from one of his doctors. When he saw that the team would be running the Boston Marathon in 2017, he submitted an application, hoping to check an item off his bucket list. On Nov. 10, 2016, one year to the day after Harner was diagnosed with AML, he was playing golf with his friends when he got the call from Team in Training telling him that his application to run the Boston Marathon was accepted. When Harner learned of his acceptance, he said he dropped to his knees and cried tears of joy. But before that moment, Harner struggled with depression and survivor’s guilt after his transplant. After going the entire summer without running, Harner finally laced up his running shoes once again on Nov. 11, the day after he was accepted to run the Boston Marathon with Team in Training. To Harner, participating in the Boston Marathon meant more than just completing a running goal. In addition to earning the chance to compete in the Boston Marathon, Harner said Team in Training also brought new friends into his life. Harner said his teammates keep him motivated on days when he wants to give up. Elise McConeghy, the New England area director for Team in Training, said Harner has been an inspirational presence for his teammates. Harner agreed that he looks at the world differently now, dedicating himself to laughing more and worrying less. Great article! Timmy is a great person. Thank you! He is a fighter and I’m so proud of his accomplishment!